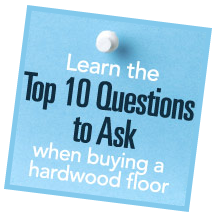 Frequently asked questions in the flooring industry, and from our followers! Basketball Hardwood vs. Synthetic Flooring – Is one better? 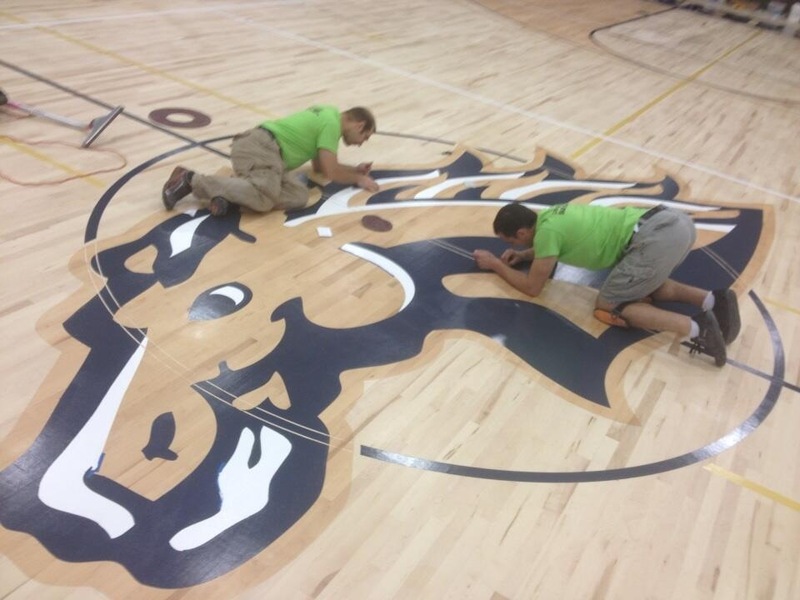 When considering what type of hardwood, maple flooring that will be used in a new or renovated gymnasium, the athletes, basketball and others, playing on the floor are of up-most importance, but so is the maintenance of the hardwood flooring. Horner Sports Flooring is the oldest and longest-standing member of the MFMA, with roots dating back to 1891 – the same year basketball was invented. We have a long history in hardwood flooring, but we also have a product line of synthetic systems. All of our systems are specialized for virtually every sports activity and engineered for the very best in athletic performance, structural integrity, trouble-free maintenance, and long-lasting appeal. We encourage those looking into athletic, hardwood flooring to consider all the uses that their flooring will be experiencing – that is what makes the difference between hardwood and synthetic flooring. Hardwood flooring has the aesthetics and performance that is associated with competing athletes. The sub-flooring for hardwood is designed specifically to have shock absorbency to prevent injuries in the athletes. The downside to purchasing hardwood flooring, though, is the cost and maintenance. So, although hardwood flooring is ideal for the athletes playing on it, multiple uses of the gymnasium may warrant for consideration of synthetic flooring. Frequent conversions between uses will have less wearing to synthetic flooring at it will to hardwood flooring. Also, a much considered benefit of synthetic flooring is the price. 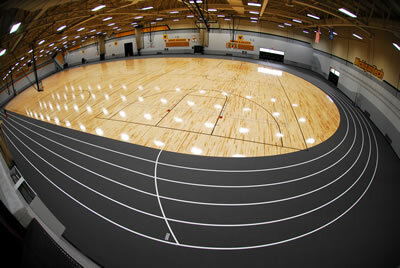 Deciding what type of athletic flooring to use is an important endeavor and one should ask themselves some questions. Sport-specific, multiple sports, or multi-purpose? Top level competition or recreational activities? Number of hours/day and days/year the facility will be used? Special equipment use (bleachers, sound stages, lifts, portable backstops, etc.)? Desired life expectancy of floor? Budgetary considerations – initial cost versus total cost of ownership? 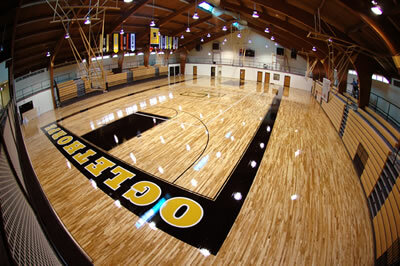 We hope you research and make the considerations you need to make the best choice for your gymnasium flooring. Horner Sports Flooring is happy to help with any of your questions or concerns. We look forward to hearing from you! When considering purchasing a hardwood athletic floor, it’s important to consider who will install the new floor. You want someone who is trustworthy and reliable and is experienced with the flooring system. The Maple Flooring Manufacturers Association (MFMA) has a list of accredited installers on their webpage. Each of these installers and flooring manufacturers are evaluated every two years. These evaluation tests ensure that the installation recommendations are being followed. Do you want to find a Horner Dealer? We have made it extremely easy, simply type in your zip code on our website and we will give you a list of Horner Dealers near you. Maintenance Tip: When your floor is installed, make sure to ask the manufacturer or installer the best ways to maintain your floor or for a cleaning demonstration. Many will do this free of charge. When considering purchasing a hardwood athletic floor, the amount of maintenance needed for the floor will be a large factor to consider. 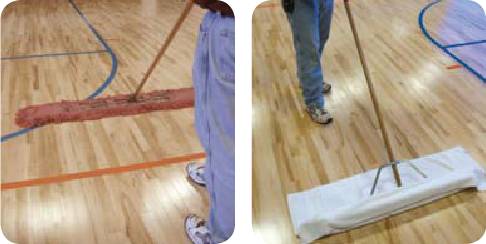 In order to keep a new hardwood athletic floor in top shape, it must be maintained. This will help protect the investment in the floor. When your floor is installed, make sure to ask the manufacturer or installer the best ways to maintain your floor or for a cleaning demonstration. Many will do this free of charge. First, it’s highly recommended to place mats or rugs by the entrances to the gym where the athletic floor is housed. This will help catch a lot of the dust, dirt, and other unwanted particles when students, faculty, or community members enter. It may seem like a small step, but it’s an important one. Daily dust moping is also highly recommended, as doing so won’t allow dust to settle onto the floor. Regular cleanings with an approved solution are also recommended, though it may be best to simply use water depending on your floor system, finish, and environment. On a yearly basis, the floor should be screened and re-coated if necessary. Additionally, approximately every seven to ten years (depending on the usage of the floor) the floor should be sanded down, resealed, repainted, and refinished. This will help to further protect your investment in the floor and prolong the life of your floor. While there are things you should do to maintain your new hardwood athletic floor, there are some things you shouldn’t do as well. You shouldn’t use excessive water to clean your floor, and beware of mops or rags that leave behind too much water. The excess water (though it may not seem like much) can seep through the finish in any cracks and settle into the sub-floor, which will increase the moisture level of the overall system, potentially causing water damage. Also make sure not to use any brooms or scrubbers which will scratch or damage the existing finish. When considering purchasing a hardwood athletic floor, maintenance is something that should be deeply considered. For more information, download Horner’s FREE eBook, Maintaining Your Horner Athletic Hardwood Floor. When purchasing a hardwood athletic floor it’s important to find one that will look good in the end. So when do you start considering game lines and graphics? Right away. Game lines and graphics are an essential part of choosing and making a new hardwood athletic floor. First, the game lines will determine the future uses of the floor. Second, considering the game lines and graphics together on the floor can help you visualize your investment and make sure you get the most out of it. 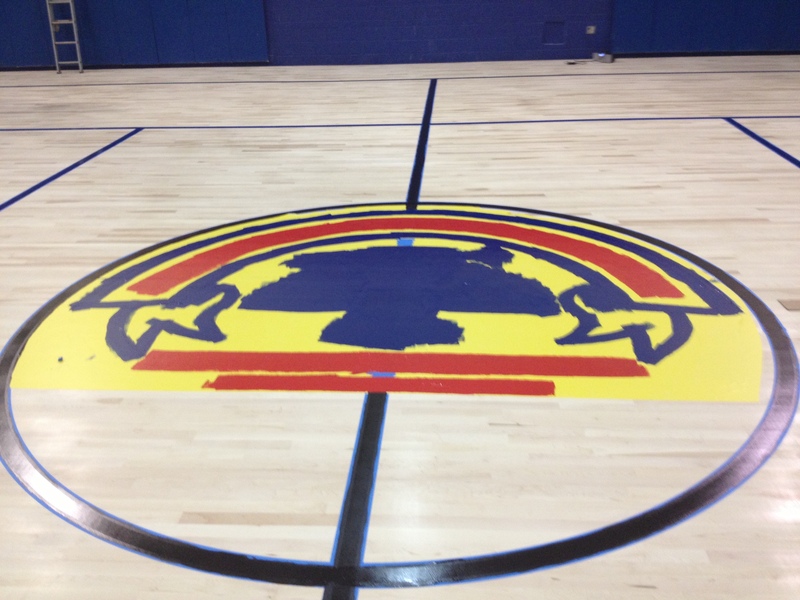 The center court logo for a floor at Rancho Solano Preparatory School. The center court logo for a Boys & Girls Club floor. Keep in mind that for basketball, there are different game markings for NBA, college, and high school levels. Some other sports, such as volleyball, are the same way. Make sure you get the correct game lines. Here are the official MFMA guidelines on game markings! The best time to apply the game lines is during the installation of the floor. It’s important to apply the game lines properly, rather than taping the floor. Taping a floor can pose injury to athletes if it creates a slippery area. It can also cause damage to the floor finish upon removal. For more information on the process of game lines and graphics, check out our FREE eBook, Applying Center Court Logos and Floor Lines.